TheRPA7000USB is loaded with 1,000 watts of power! The built in amplifier is louder than similar products on the market that are rated at 3000 watts. When manufacturing this item we upgraded the power of the amplifier. We tested these against similar items on the market and these significantly outperformed the others rated at 2000 and 3000 watts. We do not exaggerate power ratings the way other brands on the market do. This is more than an amplifier. The RPA7000USB will be the control center for your home, karaoke, or professional audio system. You can hook up (3) additional power amplifiers to the system and add more speakers. You will be able to control the gain of each amplifier individually through this receiver. You can also connect 2 microphones directly to the receiver, an audio source (mp3 player, ipod, etc), and 2 video sources, and a recorder. This model is upgraded with a USB input so you can connect an Ipod, portable hard drive, thumb drive, or other storage based device. There is a built in mic mixer with echo control, which makes this perfect for karaoke performances. This model has a built in VHL module and includes (2) wireless microphones. The remote control that is included will allow you to access all functions of the receiver quickly and efficiently. Another major advantage this model has is that it has a built in radio. 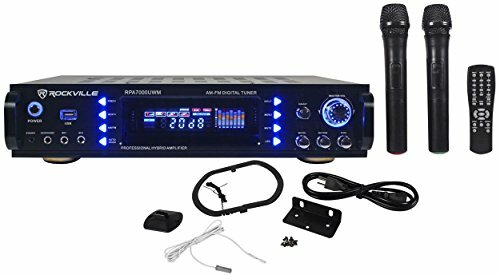 This makes it perfect for home use, and the radio is also great for intermissions during live performances. The adjustable equalizer will allow you to fine tune your music so it sounds at its best. RPA7000USB: Professional Mixing Power Amplifier with AM/FM Digital Tuner and (2) Wireless VHF Microphones. 19" rack mountable (removable rack brackets) digital hybrid amplifier/receiver. Powers 4 Speakers. 4 Ohms: 125w x 2 RMS and 500w x 2 Peak. 8 Ohms: 100w x 2 RMS and 400w x 2 Peak. Built-in Preamplifier. Multicolor LED display. Digital Quartz Synthesized AM / FM tuner w/50 presets & auto scan. Preset EQ (rock, pop, classical, jazz). Remote control for quick access to all functions. Vacuum Fluorescent Digital output display meters. Separate gain controls for pre-amp & subwoofer. Digital karaoke system. 2 front microphone inputs w/volume, tone and echo controls. Built-in mic mixer with echo control. USB input for music files from USB thumb drive. 3.5mm input for iPod / MP3 player. Spectrum analyzer equalizer display. Turbo cooling twin fan system. 1/4" headphone jack. Individual pre-amp output controls w/ control knobs. (2) Wireless VHF Mics included. Inputs and Outputs: Inputs On Front of Unit. ipod/mp3 - 1/8" mini jack style. 1/4" headphone jack. 1/4" Mic 1 and Mic 2 Inputs. USB Input. Rear Inputs. RCA Input for DVD or CD. Rear Outputs. Preamp output for an external additional amplifier or powered speaker. Sub preamp output to connect a powered subwoofer or an amplifier. Record output to connect a recording device. Rear Speaker Terminals. Banana plug / binding post outputs for speakers. THD: less than 0.1%. Input sensitivity: 400mv/33K ohm. Frequency response: (20Hz-20KHz): ±2dB. Signal to noise ratio: 80db. Tone characteristic (100Hz-10KHz) ±12dB. 110v/220v switchable. Dimensions: 19"w x 11.75"d x 3.5"h. Shipping weight: 15 lbs.